Bâtard has quickly become one of my favorite spots in New York City. Chef Markus Glocker’s unique brand of comfort food hits all the right notes, while the room is warm and welcoming. Two recent dinners were fabulous. For the sake of simplicity, I have combined both dinners here. Readers may remember this space on West Broadway, in the heart of Tribeca, as the former home of Montrachet and Corton. But Bâtard has a personality of its own. The ambience is informal, with the look and feel of a contemporary urban bistro. An occasional accent from Glocker’s native Austria comes through in cuisine that is precise and beautifully executed, but never ponderous or self-absorbed. This is food you want to revel in. The menu is offered in three versions: $58/2 courses, $72/3 courses or $82/4 courses. In addition to running the front of the house, Managing Partner Jonathan Winterman oversees a fabulous cheese selection that goes above and beyond what one might expect at this level. The fall green salad is a typical Bâtard dish. Deceptively simple, the salad is bright, fresh and just plain delicious. The greens taste as if they just came out of the garden. Another highlight, the yellowfina tuna appetizer is sublime. Taittinger’s 1976 Comtes de Champagne is rich, resonant and vinous, with all of the intensity that is typical of a vintage remembered for its drought conditions. Although this bottle is a touch forward, well-stored bottles should continue to drink well for at least a few more years. Both of our pastas are terrific. If I have one critique, it is that the portions of the filled pastas are always a bit light at Bâtard. Our celeriac agnolotti disappear pretty quickly. Bold, lusty flavors are the signatures in the fennel tagliatelle, smoked sturgeon, caviar and Pernod, a rich pasta that can stand up to richer whites or even lighter reds. What a pleasure it is to drink Mugnier’s 2011 Nuits St.-Georges Clos de la Marechale Blanc. Now with a few years in bottle, the 2011 has begun to soften and open up, making it a delicious wine for the dinner table. 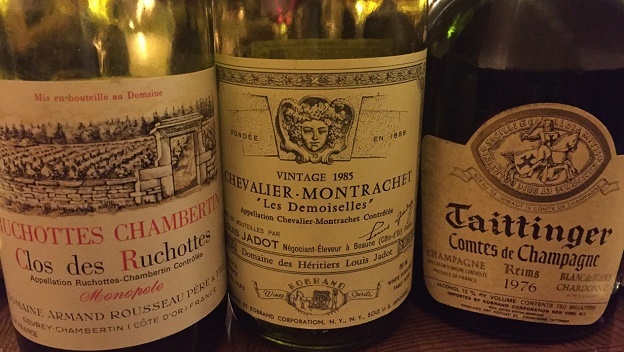 Jadot’s 1985 Chevalier-Montrachet Les Demoiselles is exotic and floral at the outset, with gorgeous depth and freshness for a wine of its age. The 1985 fades a bit with air, but it is totally sublime and striking just the same. Medallions of roasted cod with Hungarian paprika, clams, mussels, and eggplant is a perfect winter dish that pairs beautifully with our wines. The beef short rib is tasty, but just a bit dry for my taste. Rousseau’s 1985 Ruchottes Chambertin – Clos des Ruchottes is everything mature Burgundy should be. Crushed flowers, orange peel, mint, star anise and rose petal notes lift effortlessly from the glass. Although the 1985 is fully mature, it also retains a gorgeous freshness that gives it a sense of timeless elegance. Silky, polished tannins add to the wine’s considerable allure. It’s as if time is standing still. What a gorgeous wine this is. Cheese is a serious matter at Bâtard. There is no better way to finish off these bottles than with a sampling of the cart. Dauvissat’s 2007 Chablis Séchet is a tasty Burgundy with just enough bottle age to offer lovely complexity to complement the cheeses. It is one of the under the radar jewels on Head Sommelier Jason Jacobeit’s list. Slate, crushed rocks, citrus and a host of Riesling-inflected overtones grace this exquisite, deeply expressive Chablis from Vincent Dauvissat. Over the last year Bâtard has earned plenty of accolades, all of them richly deserved. Readers who have an opportunity to enjoy a meal at Bâtard should not hesitate, as the food, wine and service are all top notch.